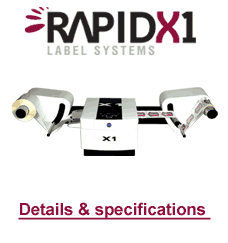 Impression Technology Americas will be showcasing the Rapid Label Systems Memjet powered Rapid X1 at Graphics of the Americas. Impression Technology Americas will be showcasing the Rapid Label Systems Memjet powered Rapid X1 at Graphics of the Americas. The show begins March 1st and goes to the 3rd at the Miami Beach Convention Center at Booth 363. Impression Technology Americas is the Master Importer for North, Central and South America. We will be there in conjunction with our South American Distributors and Imidia to display the X1. Powered by Memjet, the Rapid X1 prints at speeds up to 60 feet per minute (18 meters per minute) and at a resolution of up to 1600 x 1600 dpi. Impression Technology Americas still has Distributor territories available, so please inquire at Graphics of the Americas, or to the contact info listed below.